• The motion of the galaxies away from us, a phenomena we equate to the expansion of the universe, could be a consequence of their free fall under the influence of a gravitational field. But how could they be 'falling' away from us? • Galaxies could be accelerating towards a common point in spacetime that is outside of our observable universe. They could actually moving apart in our observable universe but if the universe is very large, seemingly flat, but actually curving back on itself, they would be ultimately be converging on a point somewhere on the opposite side of the universe to us. 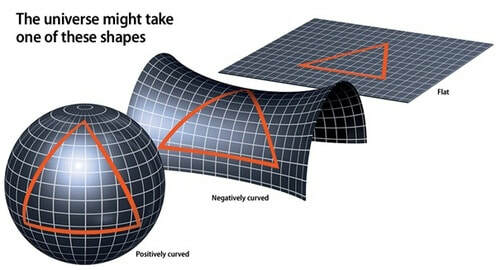 Firstly, assume the positively curved model on the above left represents our universe. Secondly, assume that the space it represents is much larger than our observable universe. Thirdly assume there is a very very large black hole at the bottom. Gravitation Potential of the universe. On the left, the universe as it was at 10 E-14 seconds after the big bang with matter in the north under inflation and antimatter at the south pole, concentrated in an antimatter black hole, a position it still occupies today. On the right, at a completely different scale, the universe as it is today. The northern region where our observable universe is located. The centre of the model represents the centre of mass of the universe. 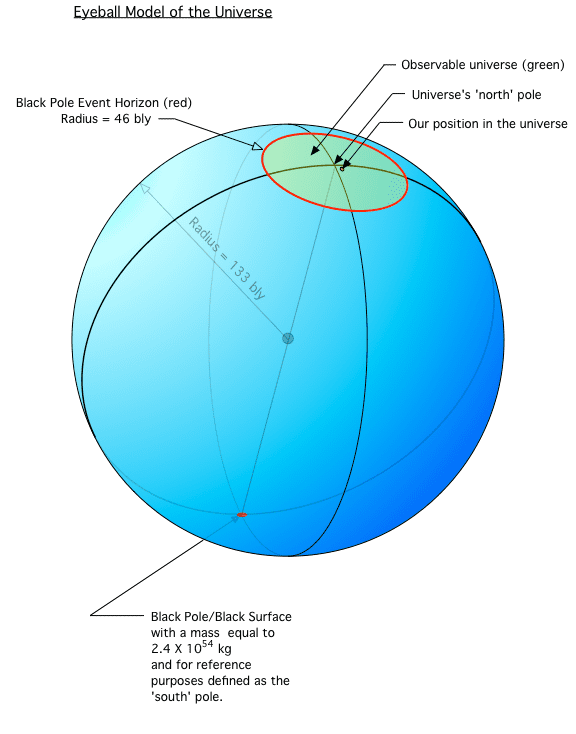 The gravitational well at the south pole is a result of 2/3rds of the mass being located there. So is our universe curved or flat? And what does it even mean for the universe to be flat or curved. Generally you can think of a flat universe such that if you travelled in any direction you could continue forever, the universe being infinite in size. A curved universe you can think of as somehow coming back on itself. If you traveled in a straight line you would eventually come back to your starting point. There is much evidence to indicate that the universe is either flat or has an unimaginably large 'radius'. Although it is very close to 1.00, it does leave open the possibility of a curved universe. ​The universe would be flat only in the scenario where Ωo equals 1 exactly. There is no agreement amongst Cosmologists regarding the large-scale structure of the universe. Main stream science leans heavily towards a perfectly flat universe. If the universe is indeed flat though, it leaves a number of questions regarding some observations, including anomalies with the European Space Agency's latest microwave background radiation data, unanswered. The anomaly map (shown on the left) is a compilation generated by ESA after processing the data from the Planck mission. The anomaly, which the agency now claims can no longer be dismissed as statistically insignificant, depicts hemispheric bias. If true, it may mean that our universe is not flat, and the cosmological principle of homogeneity and isotropism is incorrect…. And that our universe may indeed be curved. Two Links now on offer….